Fry dal on medium heat for 5 min. Add 4 cups water, onion, tomato, green chilli, turmeric powder and stir well. 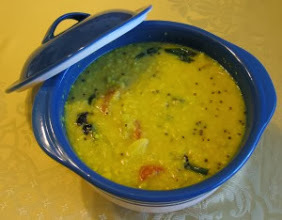 Cook until dal is soft. Remove from heat. Heat oil in a sauce pan, add mustard seeds, and cover the pan. Once the seeds have popped, add red pepper and curry leaves, stir for 15 sec, and pour into the dal mixture.